Shortly before No. 3 Tennessee tipped off with Alabama on the third Saturday of January, Vol fans everywhere had their eyes placed on what was taking place in Madison, Wisconsin. Undefeated No. 2 Michigan was on the ropes with the Wisconsin Badgers. Tennessee fans understood that with a Wolverine loss and a Tennessee win, the Vols would at least move up to No. 2 in the updated AP Poll on Monday afternoon and had a very good shot at the No. 1 spot. Behind 26 points from Ethan Happ, Wisconsin went on to defeat Michigan, 64-54. Excitement began to gather in the air for Vol Nation, but the Volunteers could only move up in the rankings with a win over a Crimson Tide team looking to play spoiler – which they nearly did. Tennessee (16-1, 5-0 SEC) defeated Alabama 71-68 despite a 30-point performance from Alabama guard John Petty. UT led by 12 at the half, but Petty quickly erased the deficit following the halftime break. During a 13-0 Alabama run to claim a 45-44 lead, Petty had eight points thanks to two three-pointers. 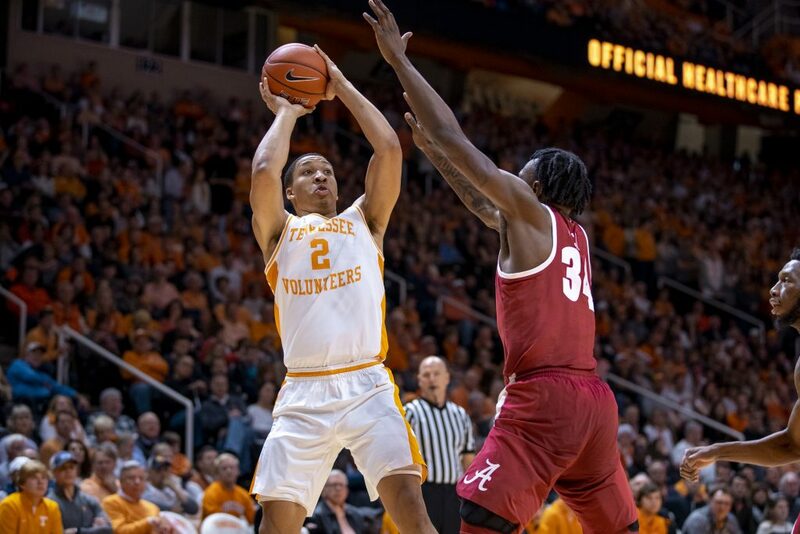 The two teams battled for the remainder of the game, but due to 10 missed Alabama free throws and a controversial travel call going against the Crimson Tide on their final possession, Tennessee won its 12th–straight game. Grant Williams scored a team-high 21 points, and Jordan Bowden had 12 points off the bench. With the win, Vol Nation’s eyes shifted to a different portion of the college basketball world. This go-round, it was to Durham, North Carolina, where undefeated No. 4 Virginia was taking on No. 1 Duke – who was upset by Syracuse on Monday night. A win for Virginia likely meant that Tennessee would move up just one spot in the AP Poll to No. 2. The Cavaliers were undefeated, and with a win over the top-ranked team on the road, would have been catapulted to No. 1. But that’s not how the game played out. Duke won 72-70, opening the door for Tennessee to be ranked No. 1 for the first time since 2008. Sure, Duke just beat a very good Virginia team, but it also lost to a less-than-average Syracuse team earlier in the week. With that loss, Tennessee has the better resume. But has Tennessee done enough in the eyes of the AP voters to earn that top spot? Jordan Bone thinks UT has. While Tennessee fans are anxiously awaiting the release of Monday’s updated AP Poll, Rick Barnes and Grant Williams aren’t wasting any time thinking about it. Following back-to-back games in which the Vols have been beaten in the second half, they’re focused on getting better. At the end of the day, it’s more important to be ranked No. 1 at the beginning of April, not mid-way through January. “I don’t think anything about it,” Barnes said about being ranked No. 1. “Is it nice to be ranked? Of course, because of the attention that comes to your program. Grant Williams echoed that sentiment. Sure, it’s just a number at this point in the season. But for the program as a whole and for a fan base that has been through a lot over the last decade, it means a lot. After all, the basketball program isn’t far-removed from having three coaches in three seasons, or even a petition that asked to bring back a coach riddled with NCAA issues that resulted in a black-eye for the program. “Just the transformation we’ve had over the years,” Bone responded when asked what being ranked No. 1 would mean to the program. “When (Rick) Barnes got here four years ago, he was trying to create a different culture and a different standard. Anybody would want to be ranked No. 1, but Williams’ motto rings loud and clear. Maybe the Vols can do both this year.